There is no job in the world that does not have its stress from time to time, but a workplace environment combined with an unfair or over-demanding boss can be just about unbearable at times..Liking your boss is optional, but you must be able to co-operate and co-exist with this boss so you can be successful and productive in your job. You must know how to relieve stress so you can function. Unless you are willing to go through the huge pain and stress of finding a new job, no solution for a jerk of a boss is perfect. However, here are some suggestions that could help you learn how to relieve stress and cope with a bad boss.Look at your boss like a parent, and think of you as the teenage child. Look at your boss like a parent, and think of you as the teenage child. I know this may sound very silly when you first read this, but the relationship that your boss and you share is very much like a parent and a child. Teens very often have a problem with their authority and have disagreements with the parental figures in their lives. And in the meantime, parents very often make rules that the children think are extremely unfair. When a situation like this gets to a bad enough place, the child will find a way to get out of that home as soon as he can and make their own way in the world. Parents are far from perfect and so is a boss- both of these authority figures make many mistakes. Are you the kind of employee that you would want to be in charge of if you were in your boss’s shoes? I understand that this completely goes against the inner desire for revenge and giving him what he deserves whenever you can get away with it; but by doing a good job at what you do he will not have as much ammunition to throw at you and make you miserable with. He may also think a little bit more about picking on one of his really good employees when he has lots of easier targets that are not doing their jobs well. Try to stay under the radar. Unless your boss is specifically targeting you and no one else, there are most likely many other people in the office that he could be targeting if you are not in his line of fire. Let another employee get the brunt of his irritability. Learn whatever you can from this bad boss. Every relationship in our lives has something to teach us- even the bad ones. When you are under a good and fair boss, you can learn what kind of boss you would like to be someday. When faced with a very bad and unfair boss, you have the opportunity to learn what kind of boss you do not want to become in the future. Do not just let yourself suffer; take something from this bad situation so you will gain something positive for yourself in the future. Observe how this boss decides to handle various situations, and take note of which reactions failed and which ones worked. You will be learning excellent leadership skills by seeing what NOT to do- and learning how to relieve stress by focusing on something other than your anger. Yesterday is now history, it is not the present any more. Try to leave your issues from yesterday where they belong- in the past, where they will not ruin your day today. Rather, begin each new day with a fresh and positive outlook. Tell yourself that not only is it a new day, but it will be a better day than yesterday. This is how to relieve stress. It is very easy to sink into a rut and just expect the worst and then act accordingly. But doing this can actually subconsciously make a person, like a boss, act how we think he will act. Be sure that you are not accidentally fuelling his fire with your attitude and your own actions. Beginning each day using a clean slate is the optimal way to get over past problems. Keeping a grudge will only make the problem worse and hurt you. Learn how to relieve stress by letting go of grudges. Do not expect other people to stop your own suffering. It is so easy to complain, but complaining does not accomplish very much. When you worry about a situation, you do not cause the problem to change or go away- you just take away your own sleep. You dwell on an issue, which just makes it ten times worse. If you always focus on worrying and complaining, you will never be happy. If the situation you find yourself in is truly hurting you, then you must begin to take steps to change the situation. “Every man is the architect of his own fortune.” Sallust, the Roman Philosopher, sums it up beautifully. Rather than worry or complain, look at your options and start taking action if that is what you need. Have you ever actually started searching for a new job? Did you ever think of improving your job skills by in-house training, books, correspondence courses, or centers for adult learning? Even a baby step in the direction you need to be going in is still progress. A jerk of a boss will not change how he behaves, but you can change yourself and improve your own job skills. 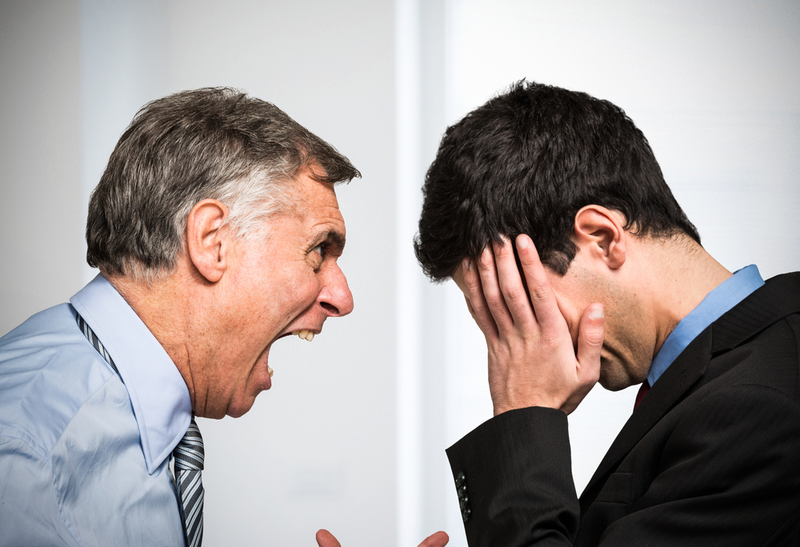 Why not allow your tough boss to be your motivation to make yourself a better person? So you can learn how to relieve stress by learning how to take your situations and use them for your own benefit rather than letting them overwhelm you.